Toyota & Lexus Melting Dashboard Repairs Are Slow: What's the Delay? When some Toyota and Lexus drivers get in their car, they see a cracked and / or sticky and shiny dashboard. The heat and humidity cause the dashboards to degrade over time. The problem is mostly occurring in the southern parts of the United States where the heat and humidity is intense. Even drivers who park their cars in their garage have noticed the dashboard problem. When the sun hits the dashboard just right, it creates a reflection that blocks the view of drivers. That’s why many car owners are concerned about safety. However, Toyota, says the dashboard issue is not a safety issue. Still, they agreed to fix the problem after my repeated stories on the problem. The repairs are happening through a voluntary warranty extension. The repairs are not subject to the National Highway Traffic Safety Administration’s oversight since this is a warranty extension and not a recall. The carmaker fixed some cars. Other drivers are on waiting lists. Then Toyota said the sheer size of the repair program and the number of colors and types of dashboards needed made the warranty extension slow. The repairs cover 4.5 million dashboards. Nearly three years since I first exposed the problem, it’s still a daily reality for many drivers. Many drivers say their cars are still not fixed. A lawsuit filed in South Carolina alleges Toyota is in breach of its own warranty program. Wanda Jeffers and Jill Gibson of South Carolina filed the lawsuit seeking class action status. The repairs, according to the warranty enhancement program, are covered through at least May 2017. Here’s how the secondary warranty works. If your car is a 2009, and was put into service January 1, 2010, then the secondary warranty runs through January 1, 2020. Hearing your ongoing complaints, I’ve been trying for a month to get Toyota to respond to slow repair concerns. Toyota responded this week, however, the manufacturer is providing little information. They will not respond to the allegations in the lawsuit. Toyota, Lexus and its independent dealers are committed to customer satisfaction and to helping ensure that repairs taking place through our dashboard warranty enhancement program occur in as timely and efficient a manner as possible. As part of our commitment to customer satisfaction, this program provides free replacement dashboards for certain Toyota and Lexus models, including many for which the original warranty expired long ago. Any customers with questions or concerns can contact the Toyota Customer Experience Center at 1-800-331-4331 or the Lexus Customer Assistance Center directly at 1-800-255-3987. I followed up with additional questions, and they like many of my initial questions were not answered. A Toyota representative told me this is all the information they have at this point. 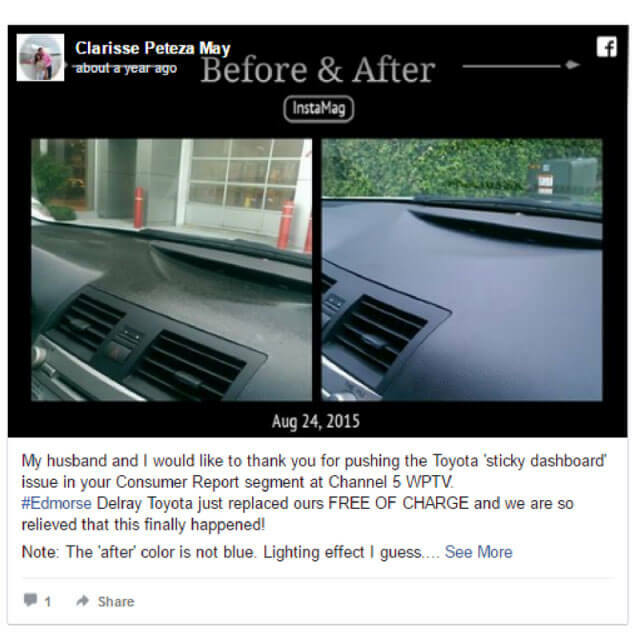 So what is Toyota telling you when you call for your free dashboard? Does your car have a dangerous defect? Melting dashboards are a problem for other vehicles too. Nissan, Mazda and Subaru have all been sued over the issue too. 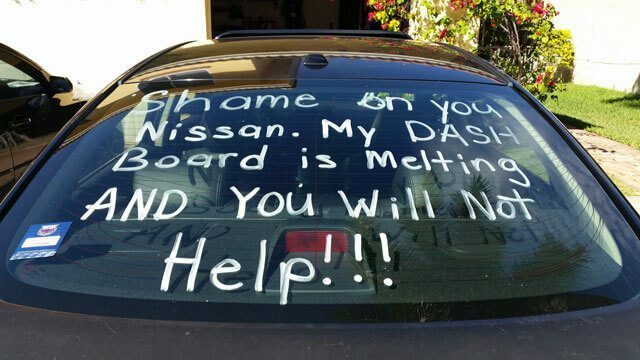 A frustrated Nissan driver took his message to the streets, as Nissan has not issued a widespread repair. Replacement dashboards are happening on a case by case basis. Mazda and Subaru are also fixing the issues on cars. Subaru repairs cover the 2005-2009 Subaru Outback and Subaru Legacy vehicles sold and leased in the United States. The manufacturer is reimbursing drivers who previously paid for repairs. Mazda is offering a warranty enhancement program on the following vehicles: 2009-2013 Mazda 6 (produced from February 4, 2008 – August 24, 2012) and the 2010 Mazda 3 (produced from October 7, 2008 – April 28, 2010). Carmakers are replacing nearly 5 million dashboards as a result of my investigation. While there is no government oversight of this warranty repair, you should still share your concerns with the National Highway Traffic Safety Administration. Also, call Toyota customer service and work with your dealer to get on the repair list. Finally, use social media to get Toyota’s attention. Is your dashboard fixed? If not, what are you being told about the wait? I have a 2005 4-Runner. I registered with the local Toyota dealership for a replacement dashboard about one year ago. They keep telling me “a couple of weeks”, but nothing is happening. I want to sell my car and get a new one, but I cannot sell it with a cracked dashboard. Thanks for your comment Roy. I know it’s frustrating. Have they given you a timeline or have you tried another dealership? I know all dealers are having trouble getting parts, but I’ve heard other drivers who called another dealer and suddenly got their dashboard. Also, try calling Toyota Customer Service directly and explaining your situation. I hope you get one soon. I’m in Texas and have a 2007 GX470 with a cracked dashboard. Over a year ago, I took my car to a local Lexus dealer and had it inspected for the dashboard replacement. Once inspected, I was told my car definitely qualified for the warranty replacement and that I would be placed on the waiting list. They said once the parts were in, they would call me to schedule the repair. I called a few days later and spoke to someone to make sure I was on the list, since I wasn’t given any written confirmation when it was inspected. I spoke with a representative who told me I was on the list, and they would call me when the parts came in, which would take 6 months to a year. This time, however, I asked her to send me written confirmation of our phone conversation and that I was indeed on the list, and she emailed me a summary of our phone conversation (albeit somewhat reluctantly). Fast forward almost a year… Last week, before the deadline, I called and asked for an update. I was told I was on the list, but the parts were still not in. Then I got a call that same day to let me know the parts WERE in and to schedule the repair. I was scheduled for today, June 6th, 2017. However, when I showed up, I was told I was NOT on the list! I then told them I had written confirmation, and I showed them the email of the letter I had from last year, and they asked me to forward it to them. I was then told that despite the letter, since I was not on their list, the best they could do was ask Lexus if they would “forgive me” for missing the deadline and put me on the waiting list. I refused to accept this “solution” and asked to speak to the supervisor. He came out almost an hour later to let me know that they would go ahead and process the repair, since he read the confirmation letter I was sent. At the same time, my mother, who also owns a 2007 GX 470 had also taken her car in for the inspection last year and was told she qualified and would be placed on the waiting list. She waited for months and called to check the status last week before the May deadline. She was told she was on the list and would be called when the parts were in. She asked if she needed any written confirmation, and they told her no, not to worry, that she was on the list. She still went in to the dealer today to speak to someone in person and was told that she was NOT on the list. The supervisor even refused to acknowledge that she had been calling and was being told she was on the list. He told her there was no record of her ever speaking to anyone and/or being placed on the waiting list. This is obviously a deliberate and deceptive scheme to trick owners into just waiting until the deadline expired. I was able to prove I had my car inspected (thanks to the written confirmation I demanded last year) and was placed on the waiting list, but my mother was lied to, and it’s now after the May deadline. What can she do legally at this point? Surely she’s not the only one they did this to. Please advise. I have a 2009 Camry, and I to have been getting roundabout answers on getting my dashboard fixed. The first time I heard about the enhancement I approached my dealer and he “put me on the list” and said there was an approximate 6 month wait. When the six months were up I called and was told my name wasn’t on the list! So November of 2016 I started the process again hoping to have it by May of 2017, and I have been keeping in contact monthly with them saying “I see your name, and your on the top of the list,” only to be here in July without a repaired dashboard yet! This is ridiculous! I Had the same thing happen to me. I have a 2003 4Runner and get the first letter. went in to the dealership and have them look at it and order the part. After getting put off for a year on the phone I went in 7/8/2017 to see what was going on. They told me that they had no record of me being in there since 2011 and that I was passed the May deadline. WOW Great customer service Atlanta Toyota! Hi. My mom has a 2007 Avalon. She never got the letter about it. Now they refuse to replace hers because it is past the date. Is there anything she can do? Thank you so much for sharing this. I have a 2006 IS250 and it’s not just the dash but also the doors. Since they didn’t put it on the Recall list for bad press prevention, I wouldn’t have known if not for you and I’ve literally been looking all night. Glad you found the information you needed! Thanks for sharing. Thanks for your comment. You should contact Toyota / Lexus. They are making new dashboards, but replacement is slow. I’ve been tracking my dashboard issue since 2014! At first, I was told there was only a Technical Service Bulletin issued about the problem. I never received any follow up from Toyota, and NO! letter informing me of the warranty extension. Just for the heck of it, I asked the representative to inform me of the information (address, phone#, VIN#, etc.) they had for me. I sat patiently while he retrieved the information. But I was astounded to hear EVERYTHING they had was Wrong! If after contacting them several times about the exact same issue, they still had my information Wrong!, how could/would they contact me? They wouldn’t! And I’m certain this was done on purpose to me and Many! others. I see that I’m not alone in experiencing Toyota’s responsibility dodging. The number of UNhappy customers and Piss Poor cusomer service speaks for itself. Toyota is obviously aware of the issue and needs to FIX it, Now. It seems as if they’re waiting for more lives to be lost due to their negligence. At one time Toyota was bar none, top quality. Now it seems Toyota, bar none is Top Dodgy. Toyota, reinstate your Andon Cord and reinstate your commitment to quality and your customers. Toyota, sorry to inform you, but you have a very unpleasant stench! I recently noticed that my dashboard on Lexus ES 350 2007 model is cracking. When I went to the dealership they told me about the expired extended warranty program. WOW Lexus team! you never informed me of the issue and kept quite, why? 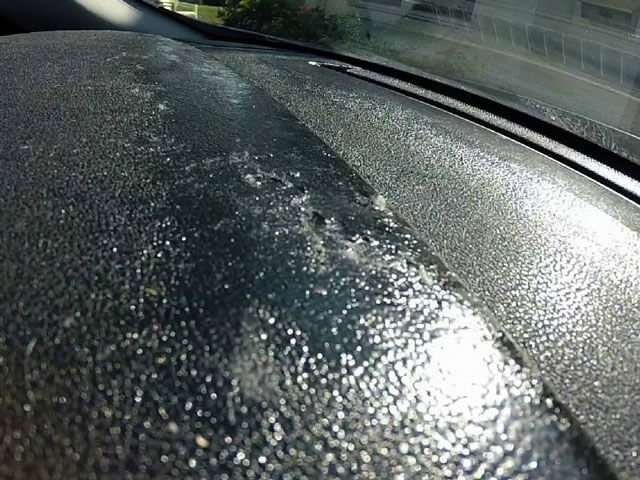 If you knew this problem is occuring on cars of my model then why did you not let me know and take care of it. and you pride on great customer service? Is there anything I can do so that Lexus takes care of this issue? I have a 2007 pre-owned ES350 and the dashboard is melting, the shine makes it hard to the see the road. Unfortunately, I did not know about the warranty enhancement program. I purchased the car in late 2014 and I did not receive any notice, memo, reminders before the May2017 cut off. I was told I needed to report the problem before the deadline to qualify for the replacement. I was rejected by Lexus USA, and I’m really disappointed with Lexus’ lack of public announcement on this issue. My frustration is this: If Lexus is already aware of the issue, why is it still a requirement to report the problem? Furthermore, they did not send out any reminders or memos to current owners. That to me seems like Lexus is shifting the burden and responsibility on the owner. Very similar to my experience. They kept it as quiet as they could and I feel their dealerships conspired to assist in this endeavor. Suddenly, the month after the deadline, it was noted to me by my dealer where I was having my ES350 serviced. Rather unscrupulous and rather a snide way to do business. Next premium vehicle will NOT be a Lexus. I am experiencing the same problem as your mom. I just spent a good part of the morning on the phone with Lexus customer service and was told that they would open a case but the rep I spoke to said in terms of transparency it’s probably not going to help. I asked why this was a warranty issue instead of a recall and was told that a recall happens when the government is involved?? This is clearly a hazzard…… perhaps we should take our local government officials for a ride on a bright sunny day. The melting dashboard is hazardous to your health. Do not breath the melting plastic!!! This can cause long term health issues, If I were you, demand a loaner vehicle till your vehicle is fixed. LEXUS needs to pay for this. Who woulda thought spending 40k+ on a vehicle can have such crappy materials. Shame on you LEXUS! I agree !!! Every time I get in my Camry I have a headache from the smell of the melting plastic . Toyota refuses to replace my dashboard because I didn’t meet the deadline. Smh !! We own a 2006 IS250 in south Florida (where it’s summer 11mo of the year), fortunately we have been following the situation from the beginning of the class action suit. We were able to get on the ‘waiting list’ “early” and got our dash replaced late 2016. But we are still waiting for the door replacements! Just called this morning to make sure we are on the list, but told there was no timeline as Toyota sends a variety of colors and they don’t know which colors they will receive next. Meanwhile, my 3yr old daughter continues to dig into the door mold with her finger nails. This is the best car I’ve ever owned, 178k miles and still strong! Toyota is obviously hoping the number of affected vehicles continue to reduce over time. I purchased a 2007 Lexus ES350 and was never notified by Lexus that there was even a recall (or whatever they wanted to call it.) My vehicle was serviced at the dealer on a regular basis but they never said a word about it until June of last year when the deadline had expired. The agent who took care of me told me on that day there was a recall but the deadline for the repair had expired. I contacted Lexus, they told me I was out of luck and it wasn’t their fault I wasn’t notified and referred me to my dealer. I contacted the dealer and they said it was Lexus Corporate who was responsible and referred me back to them. Needless to say, my next vehicle will be a BWM 5 class, Audi 6 class, or Mercedes 3 class. Perhaps these dealerships and manufacturers will not be so dishonest when it comes to repairing their own messes. I agree. I was never notified by the Nissan dealer either. When I found out about it it was pass the date and when I called them the Lexus corporation they told me we are out of luck. This is horrible customer service for The Nissan dealer here in Charleston, SC on Savannah hwy and the Lexus dealer headquarters. The dash is melting and cracking horribly. I have a Toyota Camry 2008 and was told I was beyond the deadline for the dashboard replacement. My Maserati 2014 is suffering the same problem despite my careful efforts to remove the gunk. Seems that I’m “stuck” with the problem. Jim, Complain to the manufacturer. Make sure they’re aware of it. Well, my dashboard cracked and pieces fell off in June 2018—-well past the end of the program date!! What now?? If I sell the vehicle, I’ll take a hit on the price. If I trade it in, I’ll take a hit on the value. Any update on this whole dashboard fiasco/lawsuit? Lidia, Have you reached out to the manufacturer?